LOFT‘s President’s Day weekend sale just went live at 12AM EST! Get 40% off full-price styles and an extra 50% off sale styles. Use code HAPPY. Valid in stores and online. Check out other great finds starting at $25. They are also offering $25 cash cards for every $50 you spend now through March 6th. Be sure to check out my recent purchases for some pieces that have made their way into my closet including this fabulous modern trench with a beautiful floral lining (reviewed here). 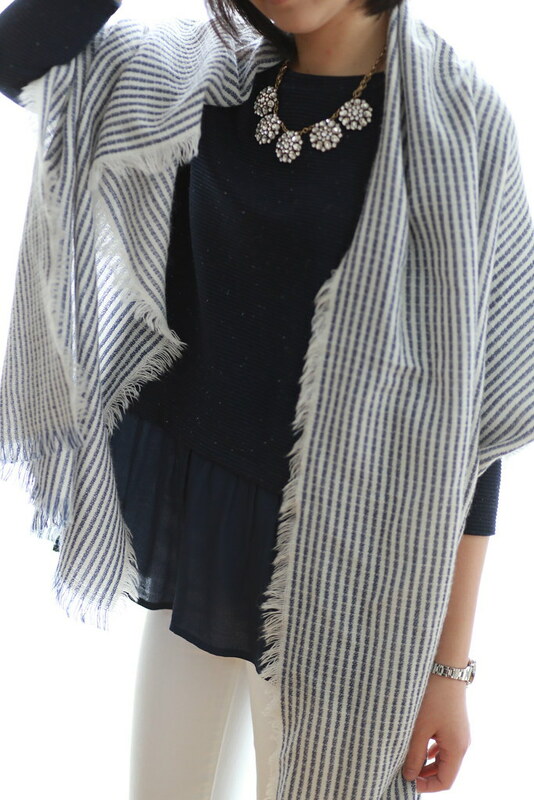 My favorite flecked two-in-one sweater (I love this top so much I own it in both colors), round crystal necklace (c/o) and mixed stripe scarf are currently on sale and an extra 50% off! I’m eyeing this sunny lace skirt (review of size 0 regular here). You can also see size 0 regular on Su. 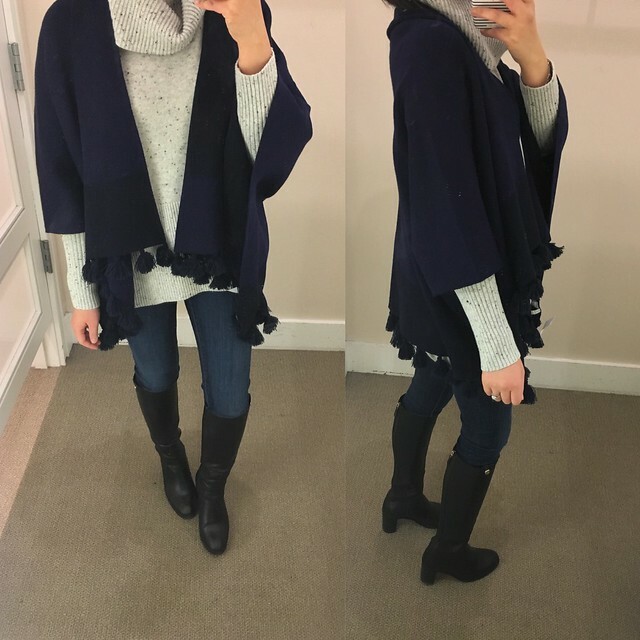 I finally snagged this Lou & Grey eyelash sweater when size XXS popped back in stock a few days ago (review of size XS regular here). I love this soft tasseled wrap which is cozy and well made. It is sewed on both sides as you can see in the above left and from the side here. See the back view here and you can also refer to this clip for a better fit of the wrap on me. 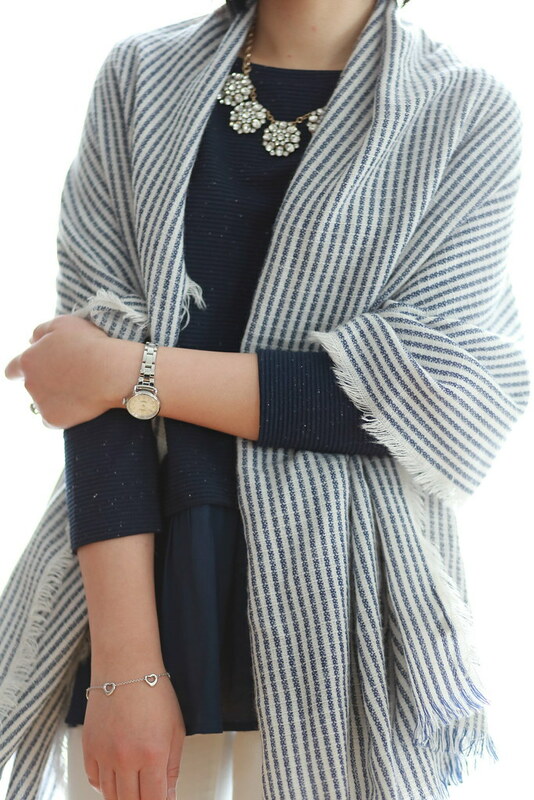 I love how it drapes and it looks very flattering and easy to throw on for an extra layer of cozy. I ordered this pretty ruffled top in XXS regular when it popped back in stock a few weeks ago. 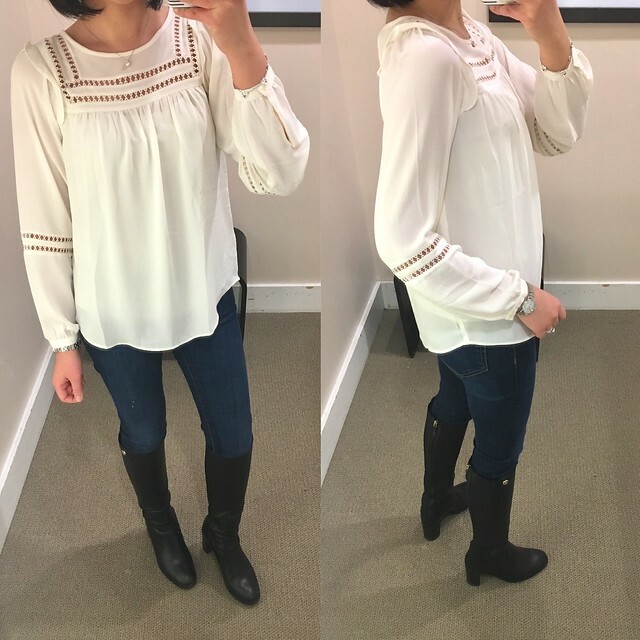 This past weekend I stumbled upon size XXS petite in the sales rack in store and I purchased it. If anyone is interested in taking size XXS off my hands please let me know. I will list it on my Poshmark (use code HPHAO for a $5 credit when you sign up) once I get a chance to wash it. 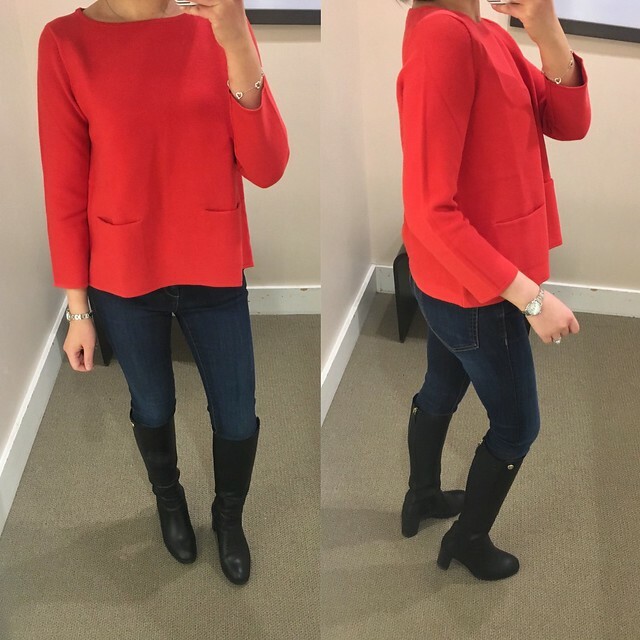 I also own this blouse in red in size XS regular as seen and reviewed here. It runs big but it does has a flattering drape. 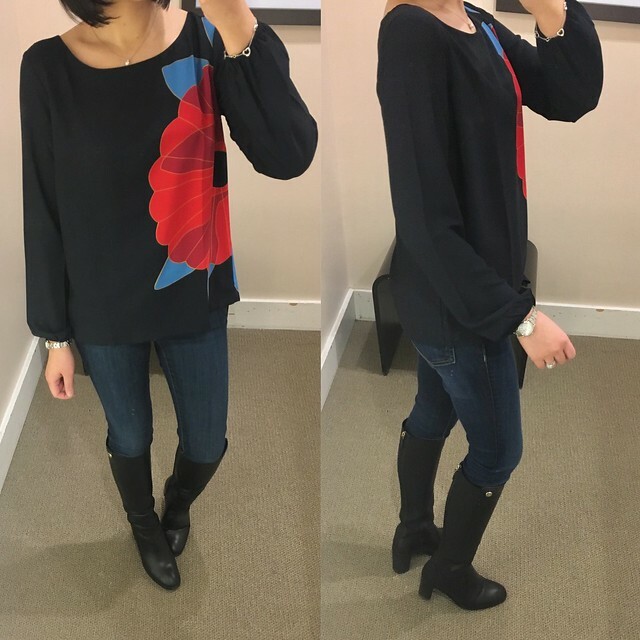 I tried on this feminine yoke sweater and I sized up to S regular for a relaxed fit. However, it does run true to size. Refer to this clip for a better view of the fit on me. 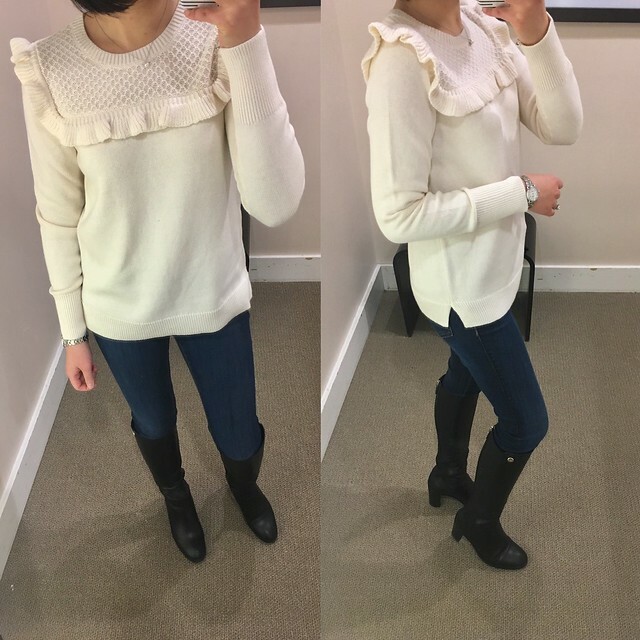 The adorable ruffle yoke isn’t too overpowering but alas I didn’t love this sweater on me so I passed. 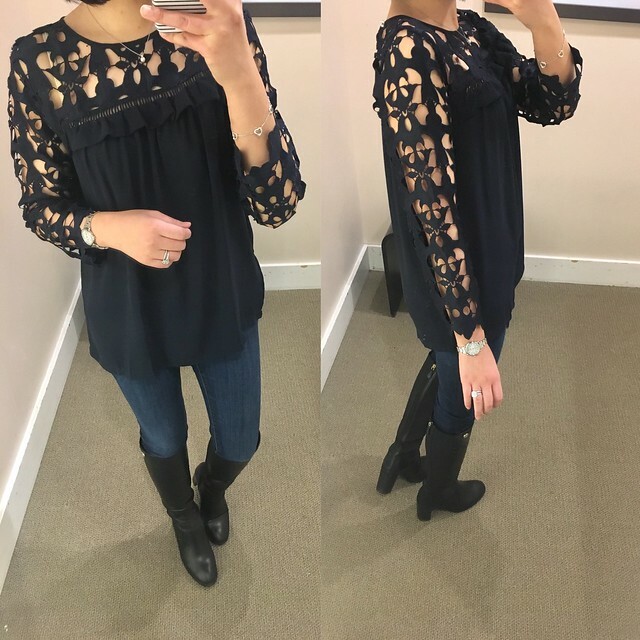 I tried on this cutout out lace top in petite XS here but this time I tried on XS in regular missy and I prefer the longer overall length and longer sleeves. The lace sleeves run wider (actually too wide on me) as a result of sizing up. I believe I need this blouse in my usual size XXS regular for the best fit. See it on the Jacqueline @themodalista here. 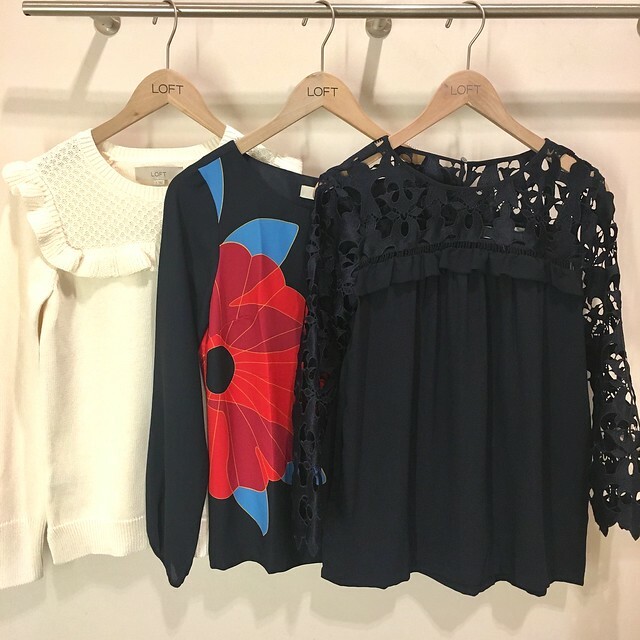 She recently took over LOFT’s Instagram for February here and here and she also picked out my favorite ruffle cuff top (she took size XSP) which I have in size XXS regular (see it on me here and here). I saw this blossom top but it was pinned back on the mannequin so it looked really cute. However, when I tried it on it’s very wide and boxy. The fit is similar to the striped lantern sleeve blouse which I had but recently letting go of in size XSP. As a quick aside, I am trying not to settle on the fit this year so I’m letting go of some items that don’t fit the best on me. Sometimes my fitting room selfies or need for instant gratification get the best of me. In these instances, it takes a quick photo shoot with my husband to realize I shouldn’t have bought something even though it was “so cute.” See a better view of the blossom print from the side view here. Su suggested that I try on this red pocket sweater and I was happy to oblige since I found it at my local store. 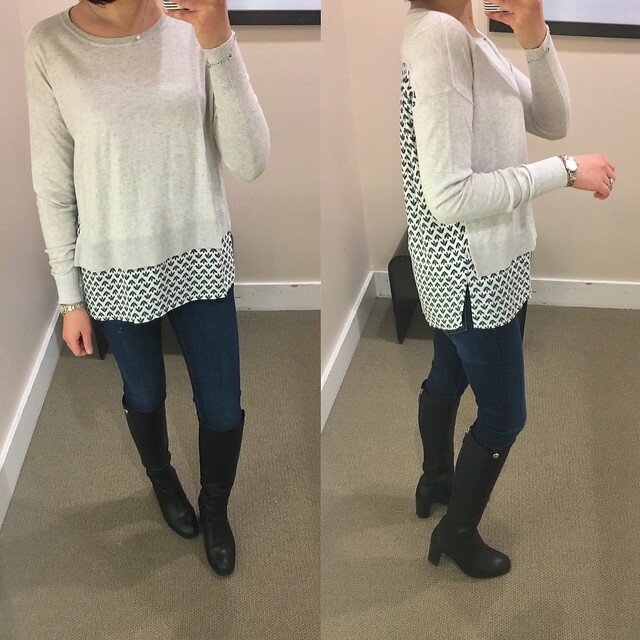 I found that this sweater has a short and boxy fit and it flares out at the hips. It has a good weight to it and it would also look cute with a button down layered underneath. I’d say it runs true to size but be prepared for it to fit very loose. If you prefer longer and more fitted sweaters then you will not like this as sizing up would make the round neckline, sleeves and overall width appear even wider. This mixed media sweater looked like it would wash well (the back lining is 100% polyester instead of rayon) so I tried it on for sizing. I like the flowerbud print in the back. It’s a thinner material which should be suitable for the spring transitional weather. I found that it fits true to size with a loose/relaxed fit. LOFT Modern Skinny Crop Jeans in Pure Dark Indigo Wash, size 26/2P – now $39.50! 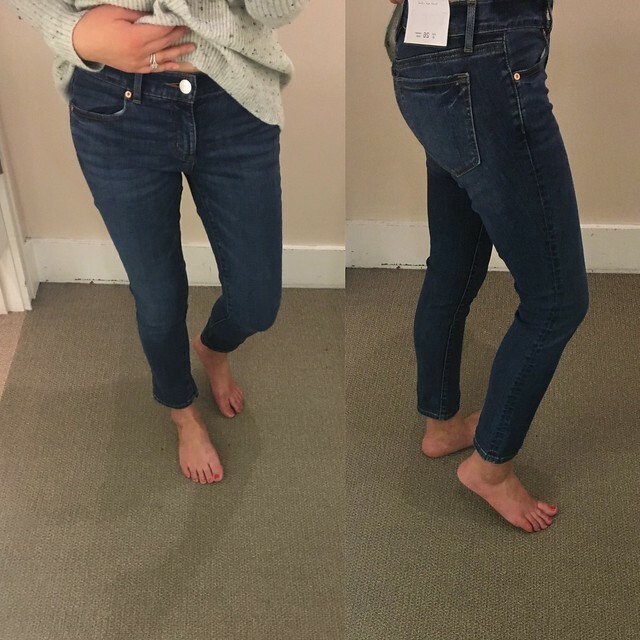 I tried on these modern skinny crop skinny jeans since Su was interested in the bright mid indigo wash which my store did not carry. I brought in size 25/0P and size 26/2P to try. I couldn’t zip up size 25/0P without a bit of a muffin top so I would say these jeans run about one size smaller. If you don’t like really tapered/narrow openings at the bottom of your jeans then these jeans flare out a little bit on the bottom when you unroll them. I personally wouldn’t wear these rolled up as pictured in the online stock image because the inseam is already slightly higher than ankle length on me. This style is available in three other washes: bright mid indigo wash, mid stone wash, and staple dark indigo wash. I’m not sure why the wash I tried on above is called the pure dark indigo wash because it looks more like a mid wash as seen here.